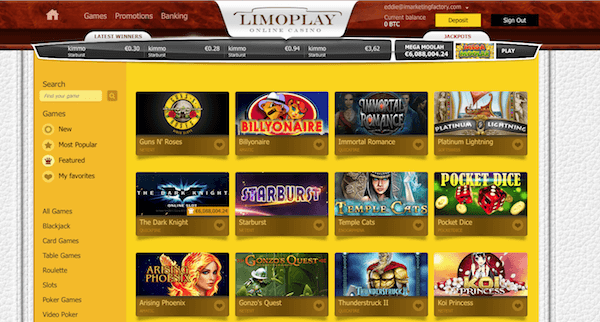 LimoPlay is the latest casino under the roof of Softswiss, a renowned company in online gambling industry. With over 600 games divided in 13 categories and provided by some of the top manufacturers, this casino cannot be taken for granted. LimoPlay is advertised as a luxurious casino that provides class and prestige, but for such high-sounding words they need a more glamorous design. It’s a matter of taste though, so maybe you won’t share our impression. On the other hand, LimoPlay’s library is full of great slots, roulette, card games provided by NetEnt, Microgaming, SoftSwiss, Betsoft Gaming, Amatic, Endorphina. It is considered a bitcoin casino, but US dollars, Euros or UK pounds are welcome too. 50% up to 5BTC Play Now! LimoPlay is operated by Softswiss N.V., a company registered and established under the laws of Curacao, that is responsible for many successful online casinos, including BitStarz, 7BitCasino and Betchain Casino. The website is virtually crowded with games. Slots take the largest part of LimoPlay’s supply, so you won’t be deprived of your favorite ones. The famous NetEnt’s Guns N Roses, Starburst, Dead or Alive or a charming Immortal Romance provided by Microgaming, along with hundreds of others, are just one click away. LimoPlay library is also filled with other games, so that in every category you will find dozens of different games. We’ve counted 26 different blackjacks, 23 roulettes (including American, European, French, Royal, Mini, etc.) and 35 pokers. You can also play Keno, Lottery, numerous Casual games, and on top of this – 24 attractive jackpots. Considering all this, you have to be in a really bad mood not to find something that suits you. Over 600 games, but not a single one with a real people and real cards, that’s a shame. However, in a virtual online casino like this one, live games are not considered mandatory. No sports betting, either. The closest to sports you can get in LimoPlay is playing a 5 reel Sport Slot provided by Softswiss. 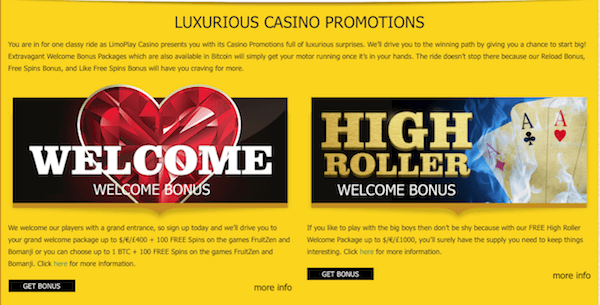 the fourth one will grant you with another 100% bonus up to $/€/£200 (or 1BTC) +25 Free Spins. Maybe it’s too complicated, but there is an obvious ambition to get loyal members by prolonged welcome bonuses. Using LimoPlay on the go is indeed an enjoyable experience. This is a mobile friendly casino, offering you loads of games displayed beautifully on the screen. We dare to say that the mobile site looks much more attractive than the desktop one. 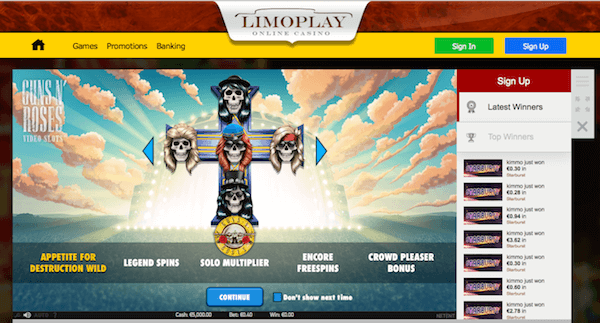 Type www.LimoPlay.com in your browser and you will be automatically transferred to the mobile friendly site, no download required. Get a 5BTC HighRoller Bonus Now >>> Play Now!